It’s been brewing for months and the war is almost here. A Battle of Titans, A Skirmish of the Sexes, A Fight of the Finalists. No, we aren’t describing a Game of Thrones episode; but the impending presidential election. It’s going to be a doozy. The television political window for the 2016 general election officially starts on September 9th and it’s set to break records on spending levels across multiple mediums – especially television and digital. 2016 marks the first presidential election without an incumbent that will benefit from the Supreme Court’s 2010 Citizens United decision, in which corporations and unions can spend as much as they want on the candidate of their choice. With massive buckets of money to spend, the media groups will be cashing in. 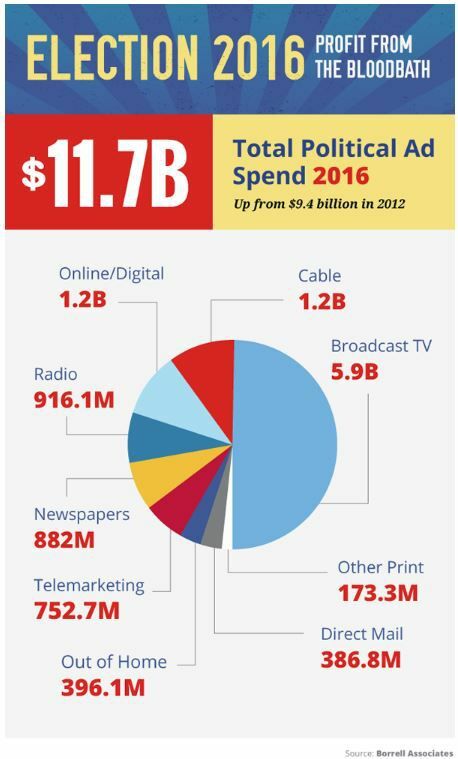 According to Borrell Associates, an ad tracking firm, the current television spending estimates are at 122% of 2012 levels with 5.9 BILLION dollars expected to go to local broadcast TV groups. 5.9 BILLION dollars! Television provides a massive reach with an estimated 87% of adults 18 and older engaging in the Traditional Medium, but studies have shown that well known candidates need a massive ad advantage to gain even the slimmest of margins above their competitor. In the Persuasive Power of Campaign Advertising, Michael Franz and Travis Ridout explain that a candidate needs a 1000 ad lead over their competitor for a .5% increase in voter share. On top of that, while it’s been proven that campaign ads affect the voter attitude, the effect is very short lived. So why do candidates continue to spend so much on television when the ROAS is so limited? Simple, they can’t risk NOT spending TV money knowing that the other candidate will. Like many sectors there has been a shift in political advertising, with more funds being applied towards digital efforts, however the change is slow. Obama was one of the first candidates to really focus on the digital and social media side of his campaign and the 2016 candidates are following suit. This year will mark the first time that digital political spend will top 1 billion dollars, and the 2020 election digital spending is expected to triple that number. There will be winners and losers in this election, and not just the candidates. Local media groups are expected to cash in. Estimates show that during political windows they can sell inventory for 40-50% higher due to demand. Media Groups like Tegna, Sinclair and Tribune are set to collectively receive about 680 Million political dollars throughout this cycle according to Marci Ryvicker of Wells Fargo; who tracks exposure and assigns weight for the different political races including the presidential race. For a breakdown of what’s expected, take a look at the infographic created by Borrell Associates. It’s safe to say that for the next couple months no one will be able to escape the political messages, unless you live on a deserted island. In that case – send me a ticket and I’ll join you.